Tatty Teddy can see now that his eyes are in. If I had realised just how much bitty back stitching was involved I might have thought twice about stitching this. I find it easier not to stick too exactly to the pattern, for the backstitching, and just do it approximately. Hi Fran, Tatty Teddies' coming on well. Just to let you know I fixed that typo on my blog's links. Aww - he is so cute! 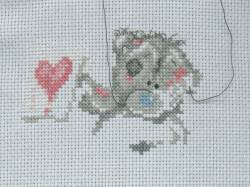 I love the Tatty Teds although I havent stitched this one yet. I know what you mean about the backstitch - I do it my own way too and actually use the holes in the aida!